Please see individual varieties for specific product information, but in general the growing information will be the same for all peppers. The majority of the information on this page was provided by the University of Arkansas Cooperative Extension Service Pepper Home Gardening Series; download the complete pdf file with FAQ’s for more information or click here to visit the website. When To Plant: Plant peppers when all danger of frost has passes and the soil temperature is warm. Charley recommends planting peppers in late April to early May when night temperatures are steadily above 60 degrees F. Plant transplants when they are 4-6” tall. Large transplants will set peppers too early and will result in smaller peppers all season. Tobacco users should wash hand thoroughly before handling pepper plants to prevent the chance of spreading tobacco mosaic virus to the pepper plants. Average Yield: 2-8 pounds per 10 foot row; 10-12 plants of a combination of hot and sweet peppers produce enough peppers for most families. Preparation and Care: Peppers require fertile soil and good drainage. Incorporate a starter 10-20-10 fertilizer into the soil prior to planting. Fertilize: Apply an optional side-dressing of 10-20-10 fertilizer using the Charley Method of one handful spread along 2-3 feet of row. Only apply this second application after a good crop of peppers is set. Applying too much fertilizer during this second application can do more harm than good. Harvesting: Uniform moisture is essential through harvesting. Peppers can be harvested at any size. Bell pepper varieties are usually picked when fully mature at about 4” long and green or yellow. Mature peppers will break easily from the plants. You can cut the peppers free when harvesting to keep from damaging the plants. Peppers can be left on the plant after they reach their mature size and will typically turn a bright red, yellow or purple; these will be sweeter and have more vitamin A and C. Hot peppers are harvested when they turn red with a few exceptions like Jalapeno. 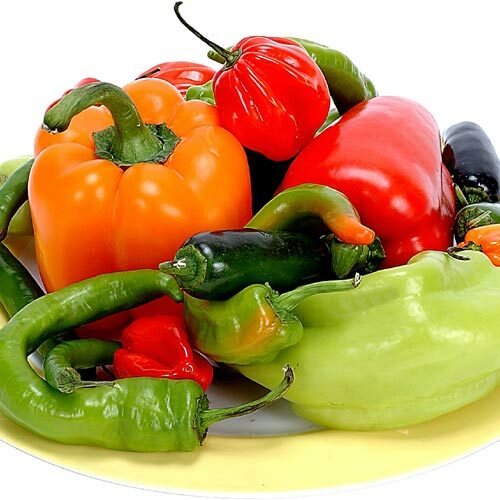 Peppers cannot tolerate frost, and do not grow well in cold, wet soil. Night temperatures below 60 degrees F will cause peppers to grow slowly, the leaves may turn yellow and the flowers to drop off. Blossom drop can also be caused when there is an excessive number of peppers on a plant.